This article is about the mineral. For other uses, see Jadeite (disambiguation). Apple-green, emerald-green, bluish green, leek-green, greenish white, white, may show green spots, rarely blue or violet; colorless in thin section. Often also banded. r > v; moderate to strong. The name jadeite is derived (via French: l'ejade and Latin: ilia) from the Spanish phrase "piedra de ijada" which means "stone of the side". The Latin version of the name, lapis nephriticus, is the origin of the term nephrite, which is also a variety of jade. 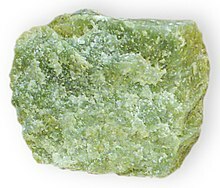 Rocks that consist almost entirely of jadeite are called jadeitite. In all well-documented occurrences, jadeitite appears to have formed from subduction zone fluids in association with serpentinite. Jadeitite is resistant to weathering, and boulders of jadeitite released from the serpentine-rich environments in which they formed are found in a variety of environments. Unusual lavender jade (metaphonolite) from Bursa Province, northwestern Turkey. The color is from jadeite pyroxene. Jadeite's color commonly ranges from white through pale apple green to deep jade green but can also be blue-green (like the recently rediscovered "Olmec Blue" jade), pink, lavender and a multitude of other rare colors. Chloromelanite is a very dark green to black variety. Color is largely affected by the presence of trace elements such as chromium and iron. Its translucence varies from opaque to almost clear. Variations in color and translucence are often found even within a single specimen. Jadeite is reported from California, US; Myanmar; New Zealand; Guatemala; Itoigawa, Japan; other localities of jadeite include Kazakhstan; Russia; British Columbia, Canada; Italy and Turkestan. Over 180 axe heads made from jadeitite quarried in northern Italy in the Neolithic era have been found across the British Isles. Because of the difficulty of working this material, all the axe heads of this type found are thought to have been non-utilitarian and to have represented some form of currency or be the products of gift exchange. A great many jadeite beads and axe heads as well as the remains of jadeite workshops from the Neolithic era have been uncovered in Itoigawa, Japan. These beads and axes were traded throughout Japan and the Korean Peninsula and were produced by the world's oldest known jadeite-using culture, centered on the Itoigawa region. Jadeite is one of two minerals recognized as the gemstone jade. The other is nephrite. Jadeite from the Motagua Valley, Guatemala, was used by the Olmec and Maya peoples, as well as the indigenous peoples of Costa Rica. In the West, the most highly valued colors of jadeite are the intensely green, translucent varieties, though traditionally white has been considered the most valuable of the jades by the Chinese. Other colors, like "Olmec blue" jade, which is characterized by its deep blue-green, translucent hue with white flecking, are also becoming more highly valued because of its unique beauty and historical use by the Mesoamerican Olmec and also in Costa Rica; however, this variety was only recently rediscovered and is only being minimally exploited by native Guatemalans. It is thus difficult to obtain and as yet too rare and little known to have attained great value as a gemstone. The commercial quality of jade is determined by the degree of translucence, cleanness of color and purity of color. Occasionally, other minerals such as serpentine or quartz are sold as jade, but the difference can be determined by cleavage and hardness. Wikimedia Commons has media related to Jadeite. ^ "Itoigawa City, Niigata Prefecture, Chubu Region, Honshu Island, Japan". www.mindat.org. Retrieved 2016-06-30. ^ "Jadeite axe-head". British Museum. Retrieved 21 November 2009. ^ "Jadeite axe". Wiltshire Heritage Museum. Retrieved 31 October 2011. ^ Barker, Graeme (1999). Companion encyclopedia of archaeology. New York: Routledge. p. 378. ISBN 0-415-21329-0. ^ Kijima, Tsutomu. "翡翠製大珠の加工と流通" (in Japanese). ^ "International Jomon Culture Conference Bulletin 1 2004 (English version)". Retrieved 2016-06-30.